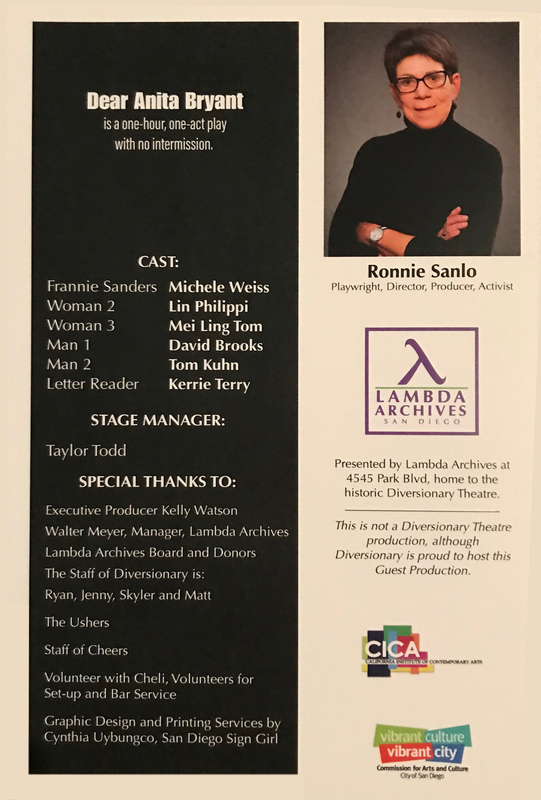 A one-act play based on a letter written to anti-gay activist Anita Bryant thirty-five years after the playwright lost custody of her two children because she is a lesbian. In 1977 singer Anita Bryant kicked off her anti-gay work in an effort to repeal Miami’s new non-discrimination ordinance. Successful, Bryant took that campaign on the road across the country. The next year the Florida legislature ruled that lesbians and gay men were not fit parents. In 1979, playwright Ronni Sanlo came out as a lesbian and lost custody of her two young children. Years later, she wrote a letter to Anita Bryant. This play, both dramatic and humorous, shares the challenges of pain and the power of forgiveness as it tells the stories of LGBT history during that time through the AIDS crisis to the present. Dear Anita Bryant is a memoir, a true story with a wide arc and an extremely relevant anchor. It makes the viewer ache, despair and rejoice and ache again, in waves and moments very familiar to each one of us who grew up during those years. And in the most unique moment at the end, the audience is brought to a place of forgiveness… the ending we all need. The READER reads portions of the letter throughout the play. In the end, she is revealed to be Anita Bryant. FRANNIE SANDERS is the writer of the letter and the woman who lost custody of her children. Theater Critic Sue Greene: It’s a memoir, with a wide arc and an extremely relevant anchor. It will make the viewer ache, despair and rejoice and ache again, in waves and moments very familiar to each one of us who grew up during those years. And in the most unique moment at the end, you bring your audience to a place of forgiveness; the ending we all need. It’s brilliant in its range but the stroke of utterly unexpected genius is the staging- one act, stationary actors, allowing the story itself to cover the distance and emotion. The moment at the end, when the phone gets picked up, was devastating, in the very best way- it relieves the anger and despair in a single, simple gesture. Absolutely brilliant.This is going to bring the house down. Playwright Robert Komishane: This play is so enthralling, well-crafted and deeply moving. Broadway actor Carol Swarbrick: I got chills more than once when reading the script! Kelly Jewell: This play showed me that I am not alone, that it’s okay to be lost and wandering. There IS a way back. Kim Keeler, LGBT Center of the Desert adminitrator: A play of honesty, compassion and vuneralabilty. You have great courage. Christine Tringali Nunes: It was so fantastic! I related so much to your story! You experienced our biggest nightmare and you’ve told your tale beautifully. Thank you!